The finalists for the Heisman Trophy were released this week and one name, the one of a sure fire candidate since he decided to return for his senior year at Oregon, was suspiciously missing. Just as recent as a month ago Riverside native Kenjon Barner was considered between the top two favorites and since the Ducks concluded their season with a victory over rival Oregon State, Barner had done nothing to dispute his candidacy. After all, Barner led the Oregon Ducks to a top four BCS ranking; his team averaged more points than any other team in college football with 50 and fourth in total offense with 6,601 yards from scrimmage. 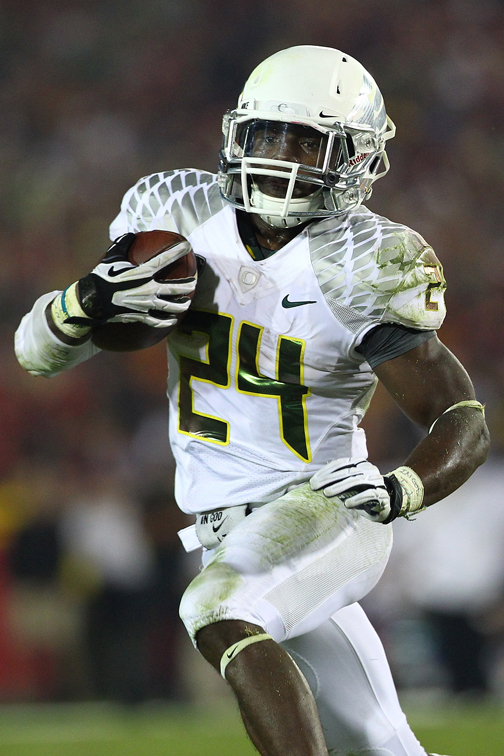 Barner is the best player on that team and among the best to ever lace up a pair of cleats for Oregon. His statistics are staggering. He is 7th in the nation in rushing with 1,624 yards, 6th in the nation in scoring with 22 touchdowns and 132 points, all the while leading the Ducks to an 11-1 record and arguably to being one of the top two teams in America. When Barner leaves Eugene after this, his senior and final season he will do so as the first player in school history since 1965 to have scored a rushing, receiving, punt return and kick-off return touchdown. So, regardless if the kid who was born in Lynwood is not invited to New York for the Heisman and even if he doesn’t win the Doak Walker Award as the nation’s best running back, he is off to a future that is much brighter than the one he had. It was a future that began as a point guard in basketball as a youth. “When I was in the 6th or 7th grade, my dad woke me up for practice and I told him that I didn’t want to play basketball anymore that I was going to the NFL,” Barner explained in an exclusive interview with LAWT. That was after the family had relocated to the Inland Empire city of Riverside. Thus a love affair began with one of America’s most violent sports, but through his youth as a Pop Warner sensation and in high school at Notre Dame ---Kejon Barner was as graceful a runner on the gridiron as he’s been a person in life. He finished second in the nation in 2007, scoring 22.8 points per game, fourth in rushing with 3,124 and finished his career scoring 46 touchdowns at Notre Dame. Barner is only one of three Riverside players to rush for over 3,000 yards in a season. However after his prep career was over there never was a thought of attending one of the local schools such as USC or UCLA. “For some reason I told my dad that I wanted to go to school back east. 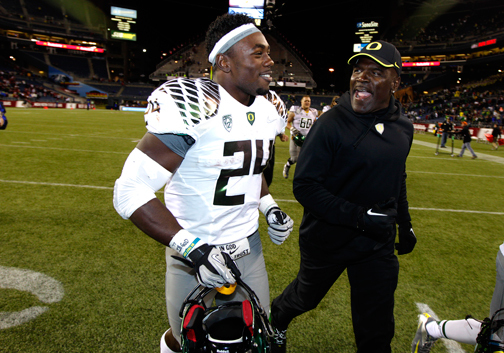 I wasn’t recruited by USC, but UCLA was interested after I signed with Oregon,” said Barner. He made USC pay dearly for not recruiting him, setting a school-record with 321 rushing yards on a career-high 38 attempts, tied for a career-high five touchdowns and also caught two passes for 26 yards in the win over the Trojans. It was the most any rusher had ever gained against a USC defense. “The entire week felt like a great week before the USC game. It meant a lot to me to be playing in front of my family and friends,” he explained. As soon as he arrived at Oregon his position was changed from running back to defensive back, but that was the least of his concerns since adjusting to being away from home proved difficult at first. At 5’11, 195 he fit the mold of a lock down defensive back, but running back coach Gary Campbell saw that his blazing speed could become a greater asset on the team as a running back. It was Campbell who was instrumental in helping Barner adjust to being away from home during that redshirt freshman year. “He provided me with the stability that I needed. He was more like a father away from home and was always there for me when I need someone to talk to,” Barner added. It helped pave the way for Barner to grow up not just as a football player, but more importantly as a man who will be the first of his family to graduate from college. Ultimately, he gives all of his credit to God and his two doting parents Gary and Wilhelmenia Barner who raised him along with his six other siblings. “Having two parents has been a major plus for me. They have always made a way and sacrificed to help me become the person that I am today. My dad has been to every game I’ve played and while my mother doesn’t fly she has been to many of my games in support of me as well,” continued Barner. Wilhelmenia will not have to take a plane to see her son when his Ducks take on the Kansas State Wildcats (11-1) in Tempe, AZ at the Tostitos Fiesta Bowl on Jan. 3rd. If the Ducks had not lost to Stanford in overtime they could be playing for the BCS National Championship. Barner has managed to keep his focus on what’s ahead and not look back. He speaks regularly to his best friend LaMichael James, whose role he inherited when James left for the NFL after his junior season. 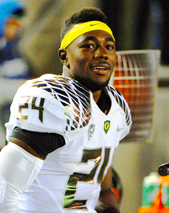 James was drafted in the second round by the San Francisco 49ers, Barner’s favorite team. He is also looking forward to being drafted into the NFL, but he has prepared for his life beyond football. 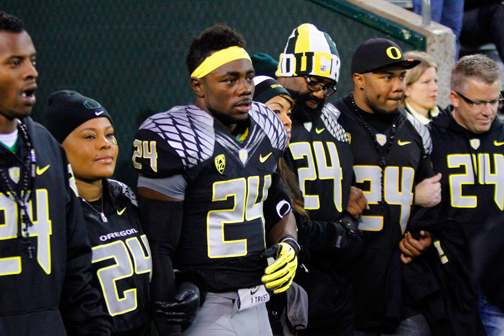 Barner suffered a career threatening concussion while at Oregon, but survived to become a star. In March 2011 he rededicated his life to Jesus Christ, explaining that he now knows just how much faith and religion means to him. “When I decided to come back for my senior year, I did so to improve my draft status, but also to finished school and graduate,” Barner said. Now, he says he can match wits with his sister Maisha who inspired him to become a better student.